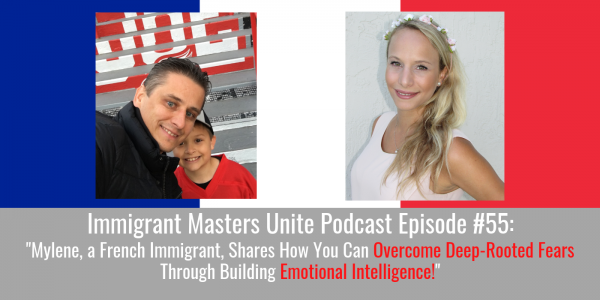 IMU 055: Mylene, a French Immigrant, Shares How You Can Overcome Deep-Rooted Fears Through Building Emotional Intelligence! | Immigrant Masters Unite Podcast: Transform Your Business, Life and The World Around You! Do you have gripping fears that hold you back from success in your life and your business? Do you have a hard time taking steps out of your comfort zone to improve your business? If yes, the listen to this powerful episode of Immigrant Masters Unite. This is Polish Peter and welcome to episode 55 of Immigrant Masters Unite. Today, I have Mylene Garot. Mylene is an outstanding business development executive and emotionally intelligent marketing leader with extensive success in driving strategic innovation, revenue growth and commercialization, with over 10 years of marketing, business development, and start-up experience. Born and raised in France, Mylene Garot has always been proactive and business-oriented. She is now working as a COO at Viac Luxury Real Estate in Miami Beach, FL. She is in charge of growing the company and as you already know, that is what she excels at. Mylene is committed in hunting for worldwide partnerships and avant-garde marketing strategies to increase Viac Luxury Real Estate’s local and national influence. Mylene is planning on improving the neighborhood of Little Haiti in Miami. Not only she desires to improve her city, but she is also aiming at converting the City of Detroit in new hottest real estate place to invest in the U.S. The importance of emotional intelligence and how you can build yours. Specifically, we discuss and dive deep into what emotional intelligence is and how it can serve you. The difference between helpful emotions and parasitic emotions, the difference between good and bad feelings, ones that can serve you in some way and others that can paralyze you. Why EQ (emotional quotient) could be a better indicator of someone’s potential for success than IQ. 4 easy ways to discover and rate your own emotional intelligence. Listen closely as Mylene explains how to analyze yourself to see what your emotional intelligence is. Tips on how to get out of your comfort zone, how to deal with difficult situations, circumstances and stress. In fact, one of these strategies involves empathy and that is what I talk a lot with my own coaching students. So, head over to the Itunes or Stitcher right now and listen to the podcast. Once you listen to the episode, share it with others who you think would benefit from this episode.